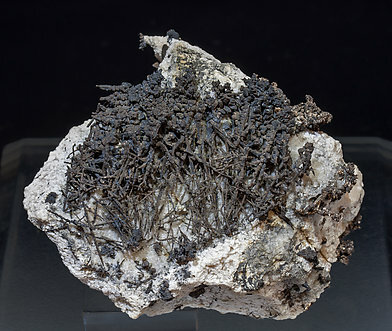 Dendritic growths, on a matrix of massive Calcite, of elongated native Silver crystals that are very well defined and bright, partially coated by Acanthite crystals. The Calcite matrix has been etched with acid to expose the Silver. 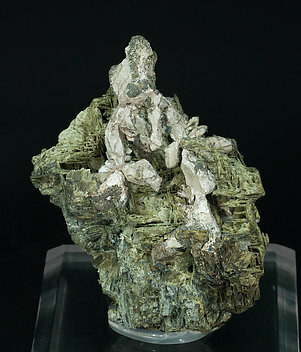 From an exceptional find in 2010 that provided excellent samples of Silver with Actinolite. 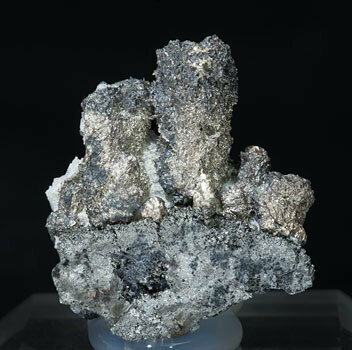 In this case it is an aggregate of thick and elongated Silver crystals with very well defined faces and edges that are on a matrix of fibrous Actinolite. The Actinolite has been analyzed and we’ll send a copy of the analysis to the buyer. 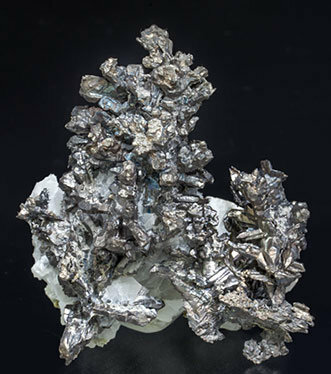 From an exceptional find in 2010 that provided excellent samples of Silver with Actinolite. 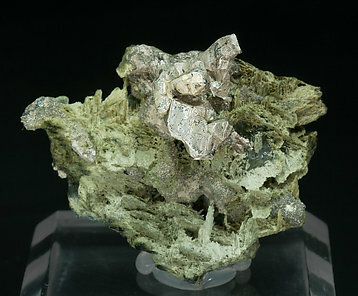 In this case with an aggregate of thick and elongated Silver crystals with very well defined faces and edges and on a matrix of fibrous Actinolite. The Actinolite has been analyzed and we’ll send a copy of the analysis to the buyer. 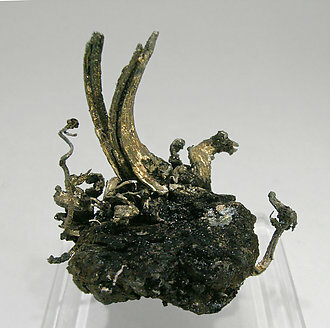 Wire growths of very much elongated crystals that have a good luster and are on matrix. A curiosity: columnar Silver growths with only slightly defined crystalline surfaces, on matrix, with associated Arsenopyrite, silver-rich Tennantite and Pearceite. All the species on the sample have been analyzed and we will send a copy of the results to the buyer. A novelty at Sainte Marie-aux- Mines 2016. 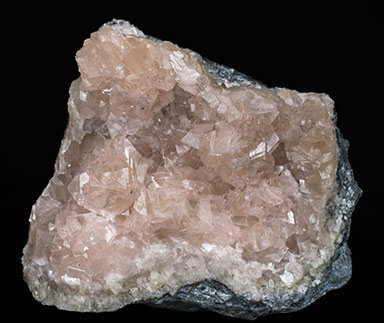 Very aerial arborescent growth, on a Calcite matrix, of bright crystals with their faces slightly deformed but well defined. No similar samples are known from this mine. 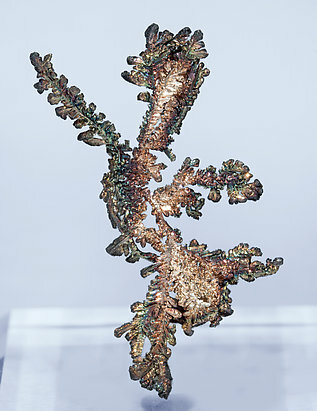 Floater and dendritic growth of very well defined and bright Silver crystals partially coated, especially at the tips of each crystal, by native Copper. Druse of rhombohedral Smithsonite crystals on matrix. They are well defined with fine growth striations and are translucent, bright and have a uniform and attractive pinkish color. 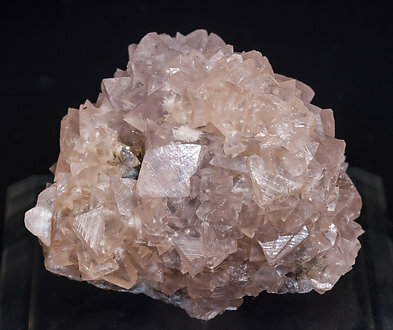 An aggregate, on matrix, of rhombohedral Smithsonite crystals with very well defined finely curved edges, they are between translucent and transparent, bright and have a very uniform pale salmon pink color. Botryoidal Smithsonite with a very aerial character, with a pale blue color and areas with intense blue shades. 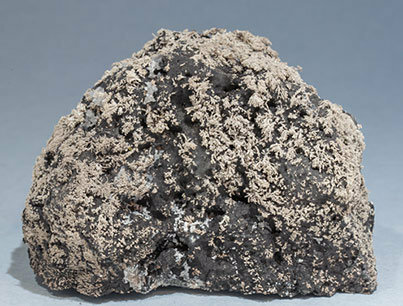 The sample is very typical for Kelly Mine samples, an American classic. 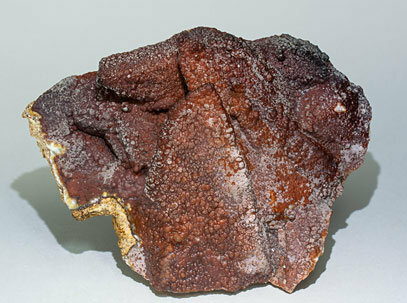 Aggregate, on matrix, of translucent rhombohedral Smithsonite crystals with a deep brown color and slightly orange shades. A classic from Namibia with great quality. Druse of Smithsonite crystals on matrix. They have the dominant form of a rhombohedron, with very well defined faces and edges and a soft orange color due to the presence of cadmium. This cadmian Smithsonite variety is surely the rarest found at Tsumeb. 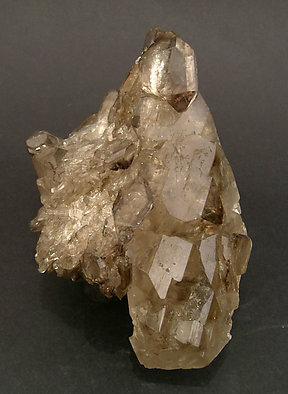 Aggregate on a Galena matrix of rhombohedral crystals with very well defined faces and edges and slight curvatures, with neat and very well marked geometrical zoning. They are very bright with a very intense yellow color, slightly orange. The sample is the cadmium rich variety, the rarest by far. 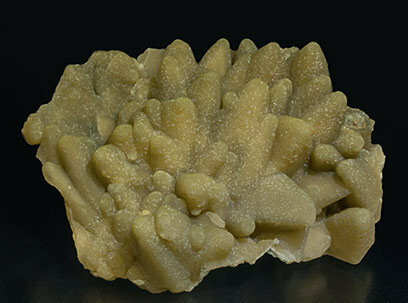 Smithsonite growths pseudomorphous after scalenohedral Calcite crystals. The color is between brown and yellow and their edges are bordered by botryoidal growths which are partially coated by white Hemimorphite. 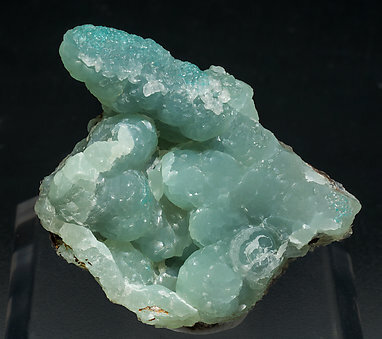 In spite of the fact that the Smithsonite and the Hemimorphite from this mine are well known, to our knowledge there are no references about these Smithsonite-Calcite pseudomorphs. 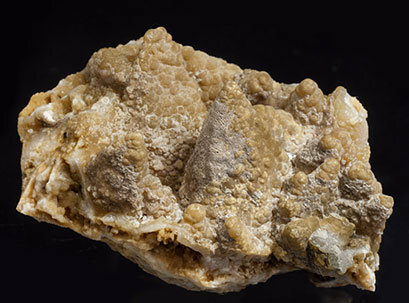 Perimorphic microbotryoidal Smithsonite growths, very rich in reddish inclusions, very probably of Hematite, coating the scalenohedral forms of a group of Calcite crystals. Like so many specimens in this collection, this one is of great quality for the locality. A novelty at MineralExpo Sants (Barcelona) 2017. 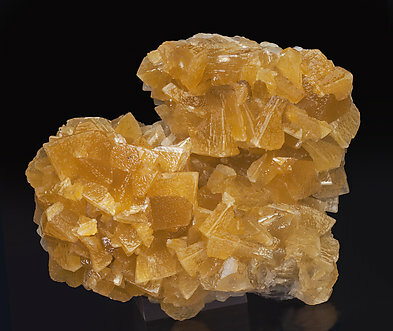 Smithsonite replacing Calcite crystals. 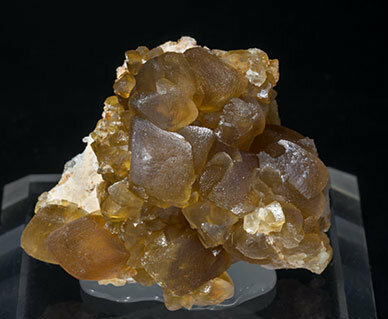 It is yellowish and partially coated by small white Hemimorphite crystals. Both the Smithsonite and the Hemimorphite have been analyzed and we’ll send a copy of the analyses to the buyer. A novelty at MineralExpo Sants (Barcelona) 2017. 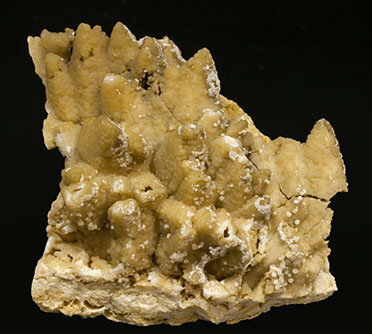 Aggregate of Smithsonite replacing and partially coating Calcite crystals. 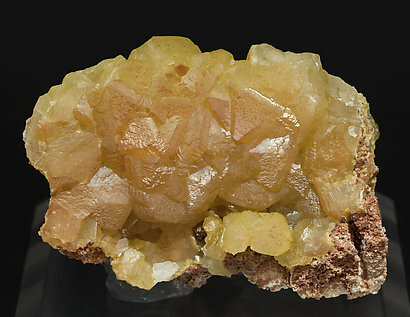 It is yellowish and partially coated by small white Hemimorphite crystals. Both the Smithsonite and the Hemimorphite have been analyzed and we’ll send a copy of the analyses to the buyer. 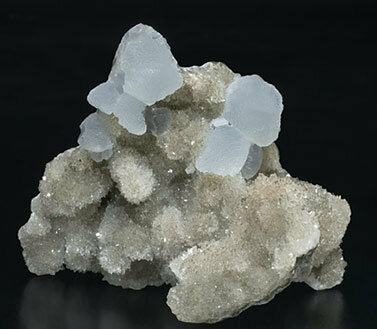 Aggregate of Smithsonite crystals replacing Calcite. They show successive replacement shells indicating that the Calcite was only partially replaced during a first phase, and later completely replaced by Smithsonite. We'll send a copy of the analysis of the Smithsonite to the buyer. 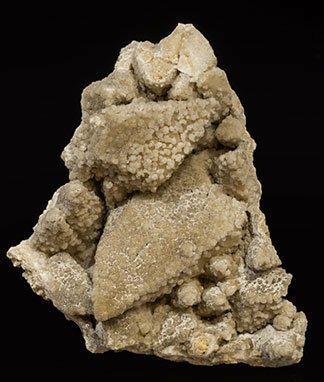 Botryoidal aggregates of small white Smithsonite crystals on a matrix coated by small and very bright Hemimorphite crystals. One can see different crystals that have grown in various directions. To me it looks like it is the very complex crystallization that gives the specimen so many faces, which means that any movement creates numerous reflections. It is a very original floater with zones of smoky color and multi-colored reflection from its interior. 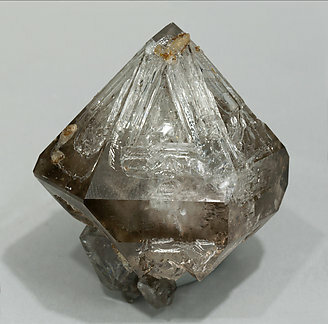 Group of crystals, one of them clearly dominant, with a very short prism, very well marked window growths on rhombohedron faces and a particularly intense glassy luster. 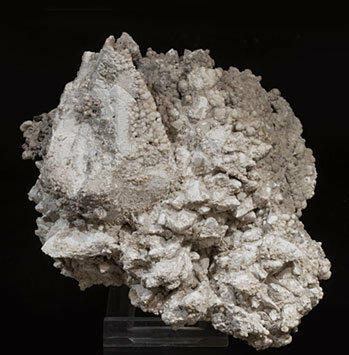 Good samples from the Grant Quarry, aside from their scarcity, are specially appreciated by advanced collectors due to their high quality, and the neat inner forms of growth and dissolution. 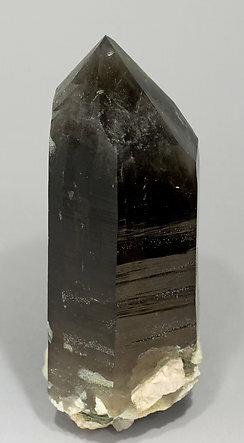 Single crystal of very deep colored smoky Quartz. 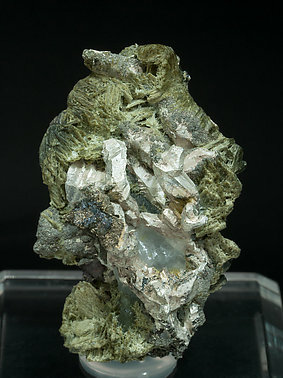 It is transparent and bright and it is on a small matrix of Microcline and Albite, with leafy growths of Muscovite. The crystal shows a notable phantom growth at its termination.